On the spot where John Brown was shot, a flat stone was placed many years ago. 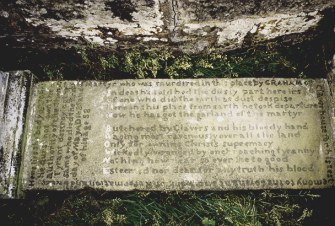 The epitaph is in the form of an acrostic. This has been enclosed with a wall, and in the interior a square pillar was erected in 1826. 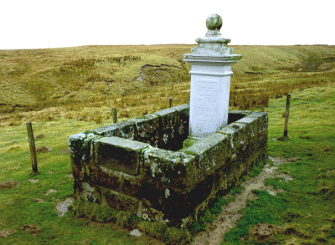 The gravestone is located on a remote stretch of moorland to the east of Priesthill farm, three miles north-east of Muirkirk. It comprises of the original tablestone, with an inscription that forms an acrostis, enclosed within a low wall. At one end is a later upright memorial. tyrant destroying the same, who died the first day of May AD 1685 and of his age 58. Now he has got the garland of the martyr. Nothing now near soever he to good Esteemed, nor dear for any truth his blood. me shall be lightly esteemed. One of the most touching and tragic incidents of the persecuting times was the cold-blooded murder of John Brown, who is familiarly known in history as the " Christian carrier." He lived at the farmsteading of Priesthill, a few miles from Muirkirk in Ayrshire. The house was situated on the summit of a gently rising ground, fronting the east. He was the Ayrshire carrier, a man of blameless life, who had taken no part in the rising or public demonstrations of the Covenanters. His only crime was non-attendance on the curate of the parish, and retiring with others like-minded with himself to the moors for prayer and praise. This was quite sufficient to make him a marked man, and his name was on the list of fugitives in the Royal Proclamation, 5th May, 1684. When the persecution became darker around his homestead, John could no longer be allowed to remain at peace, but was compelled to leave his house, and seek shelter in the remoter solitudes of the country. On the 1st May, 1685, he was at last captured in his own home, where he had been unmolested for some time. He had risen early and performed family worship. The chapter read that morning was the 16th of John, which closes with the remarkable words --" In the world ye shall have tribulation; but be of good cheer, I have overcome the world." He then went out to prepare some peat ground. Meanwhile Claverhouse had heard of John, and arrived early from a neighbouring garrison. He tracked him to the moss, and surrounded him with his troopers. Leading him down to the door of his own house, his brave, heroic wife, warned of his approach, with one boy in her arms and a girl in her hand, came out to meet him, and calmly play her part in the frightful tragedy. Claverhouse asked John why he did not attend the curate, and if he would pray for the King. John gave the usual Covenanting answer, on which Claverhouse exclaimed, " Go to your knees, you shall immediately die." John prayed so fervently that the dragoons' hard eyes began to moisten, then turning to his wife, he reminded her of having said that this time might come when he first proposed marriage, and asked her if she was willing to part with him.
" Heartily willing," was her reply. " This," he said, " is all I desire. I have nothing more to do but die." He then kissed his children, and said, "May all purchased and promised blessings be multiplied to you." "No more of this," roared the savage Claverhouse, and ordered six dragoons to fire; but they stood motionless. Fearing a mutiny, he snatched a pistol from his belt, and shot the good man through the head. Then turning to the wife, he said, "What do you think of your husband now?" to which she replied, "I aye thocht muckle o' him, but never sae muckle as I do this day." There are some people who think that James Hogg's novel, The Brownie of Bodsbeck, is really based on John Brown of Priesthill. 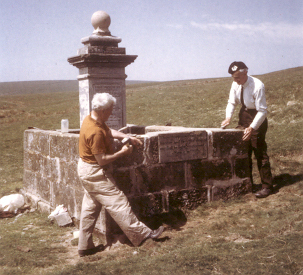 Two of the founder members of the SCMA, Walter Storrar and William Stirling, about 1971, at Priesthill.